Name for a reddish colored rock, which originated in the geological time period Rotliegend. The striking red color is caused by finely divided hematite scales (red ironstone) and refers to the deposition in the hot climate, Rotliegendes is an old miner's expression. The soil is made of calcareous clay, siltstone and sandstone. He has only a limited Water storage capacity, but has a good ventilation. The rooting of the deeper rock is difficult. The term is particularly in the German cultivation areas palatinate and Rheinhessen and also Near for the there occurring vineyard soils common. 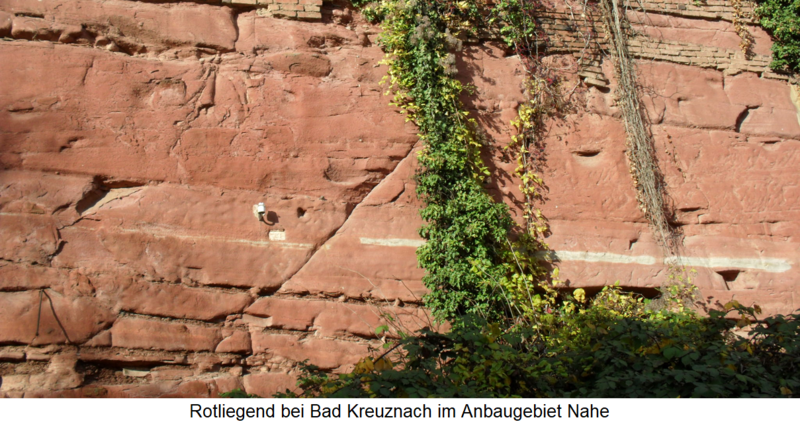 These come in the form of red slate especially in the "red slope" within the as Rhine front designated area before. Another iron-containing soil type is considered as Terra Rossa designated. This page was last modified at 8 July 2018 at 14:06.